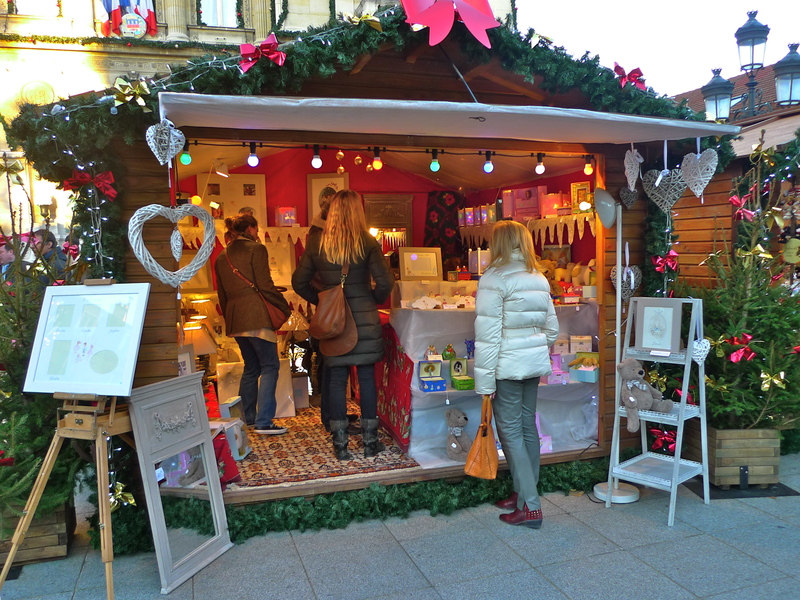 WHEN I PUBLISHED my previous blog piece I thought that I’d said everything I needed to say about my local Christmas market – but it turns out there is a post-script. 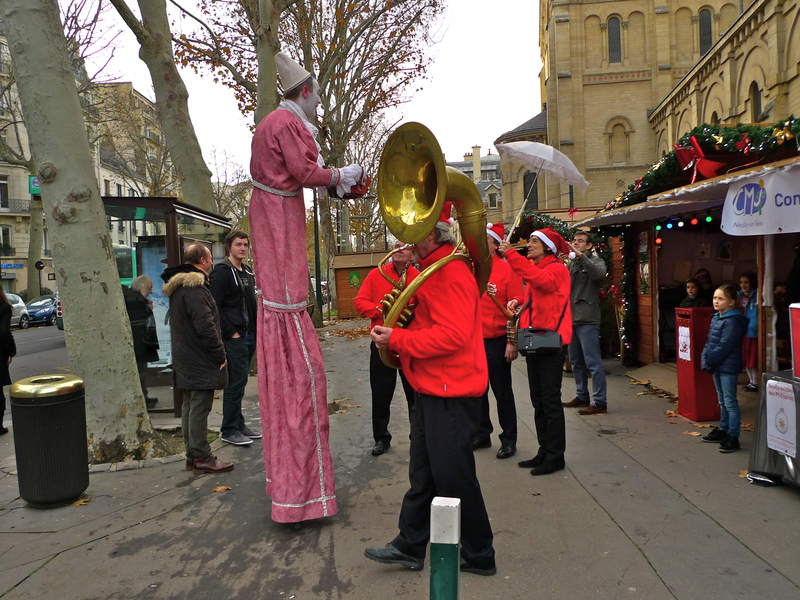 When I went to get bread from my local boulangerie last Saturday afternoon I discovered a different Jazz band playing in the Christmas market, the Gibsy Quartet. 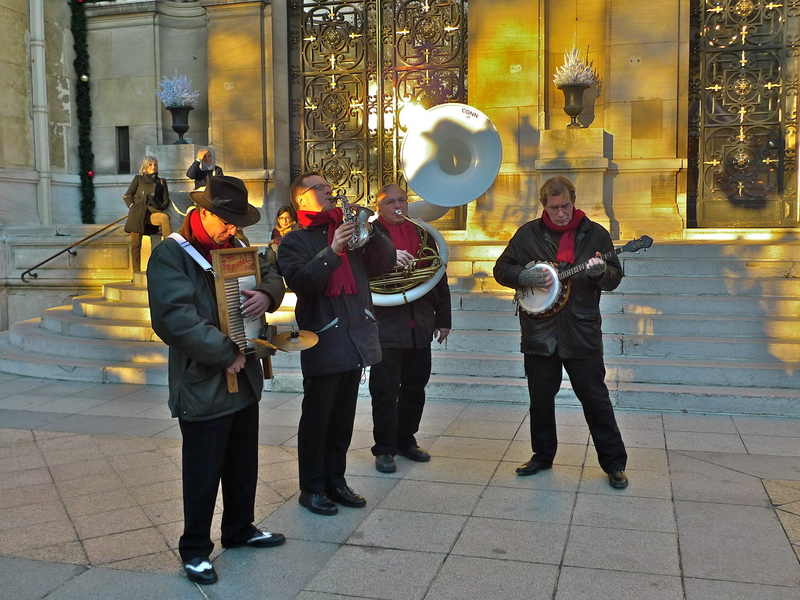 They were very good and so I decided to record them for my Paris Soundscapes Archive. Over the years I’ve learned many lessons about how to record the sounds of urban life around me and one of the most valuable lessons I’ve learned is never to turn my sound recorder off as soon as I think I have a recording in the bag. 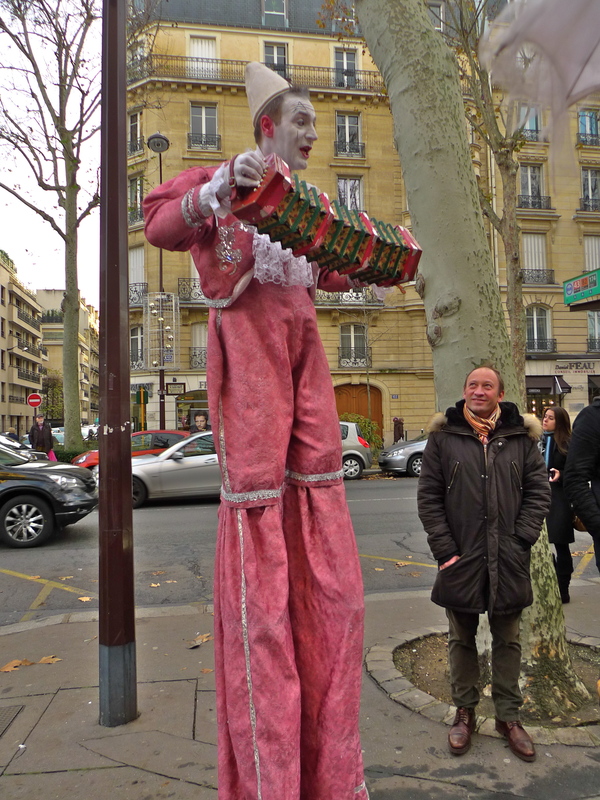 Urban sounds can often be quite unpredictable and fascinating sounds can sometimes turn up when you least expect them. Another lesson is that what you might think are fairly ordinary sounds can suddenly become quite extraordinary. 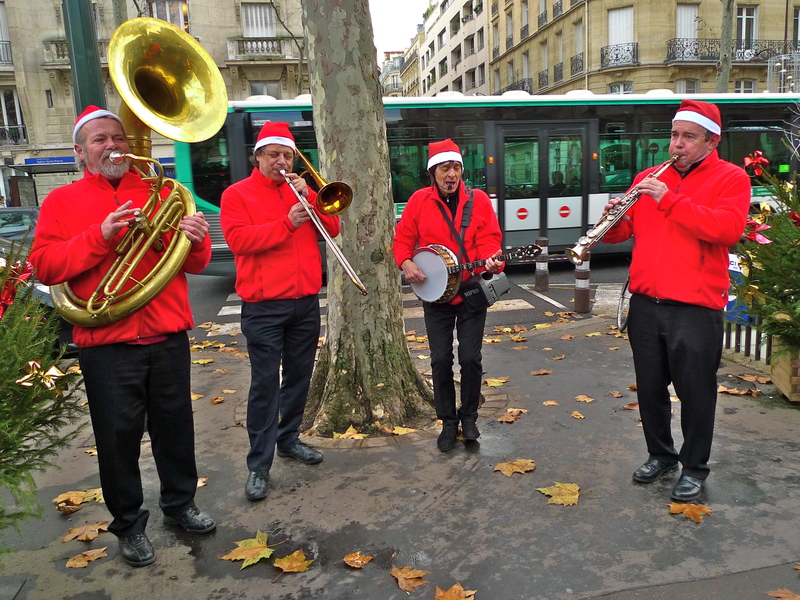 One could argue that recording a jazz band playing in a Parisian street is nothing out of the ordinary, once you’ve heard one you’ve heard them all some might say. But when events have a twist in the tail then the ordinary becomes extraordinary. I recorded the Gibsy Quartet on Saturday afternoon. 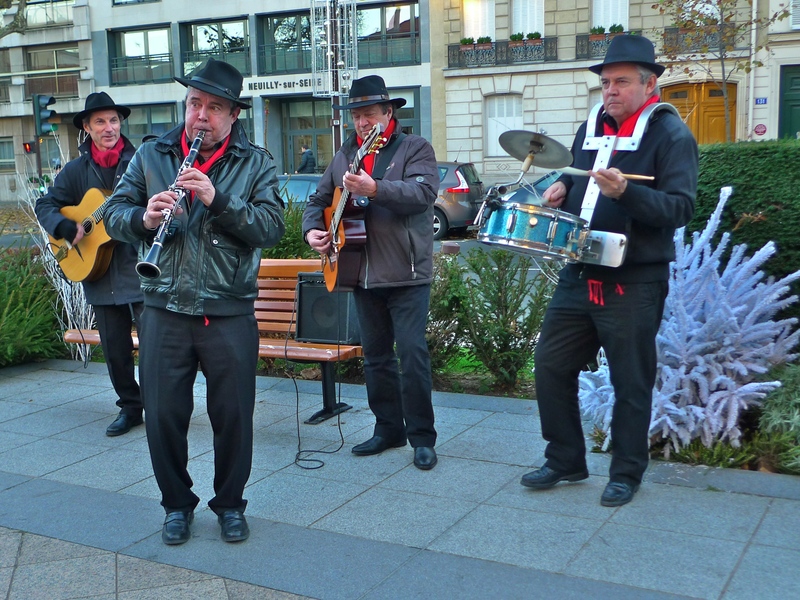 They were going to be at the Christmas market for much longer than I was so I recorded them playing two pieces and then I was about to head off for home. 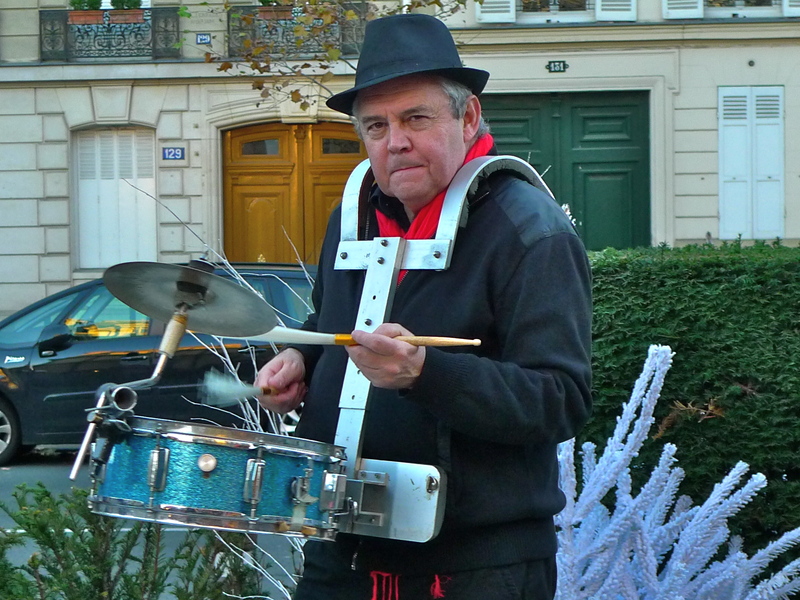 As is my practice, after they finished their second piece I left my sound recorder running and then, as I turned to walk away, this astonishing man appeared. From his lofty perch he began singing and playing his concertina and I, the jazz band and several other people began to gather round him. 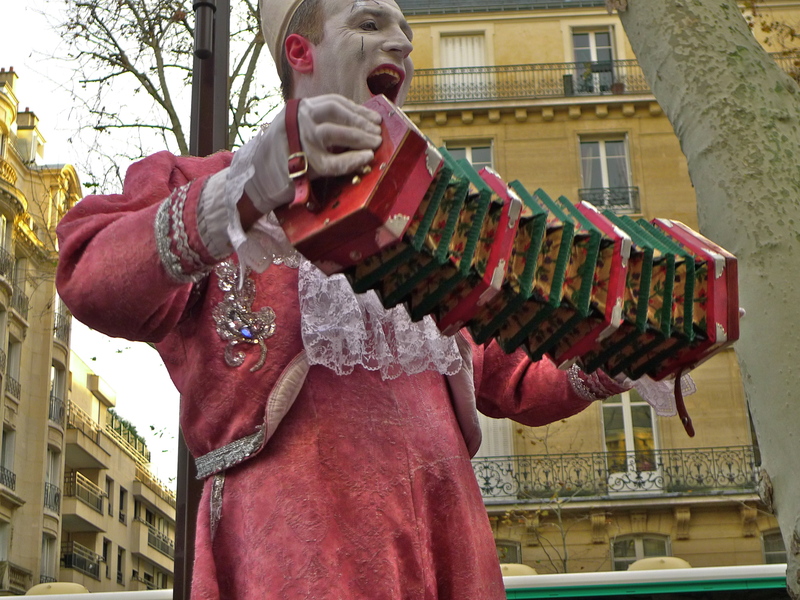 He spied the band beneath him and without hesitation he began to sing the Neapolitan song, O Sole Mio, an open invitation to the jazz musicians so used to improvising. 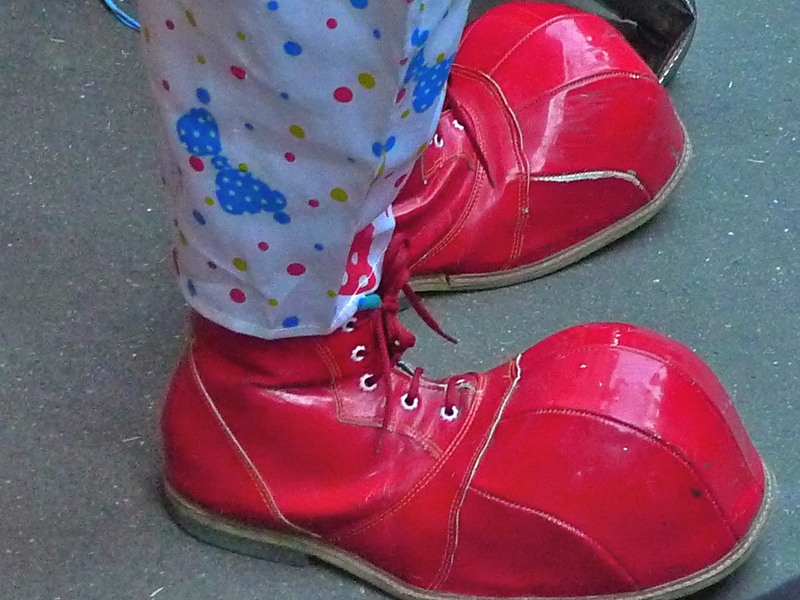 And improvise they did turning the ordinary into something quite extraordinary. I’ve never lost my enthusiasm for recording the soundscapes of Paris, but if I ever do I shall listen to this recording and remind myself of why I do it. Capturing unexpected and unrepeatable sounds like this always gives me a buzz and listening to these sounds will always remind me of my local Christmas market, the infectious enthusiasm of musicians and the delicious smell of freshly baked bread in my local boulangerie. 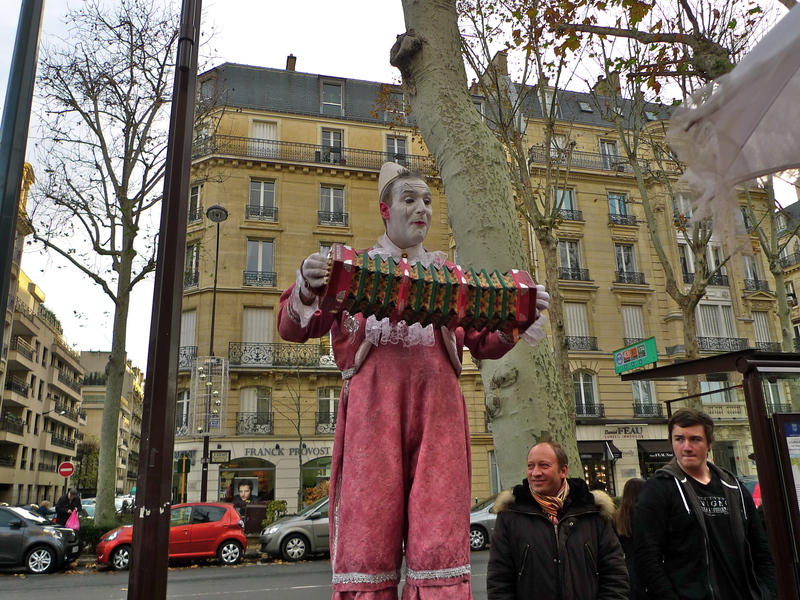 AT THIS TIME OF THE YEAR the Marchés de Noël, or Christmas markets, spring up all over Paris and I have three of them within easy reach of me. 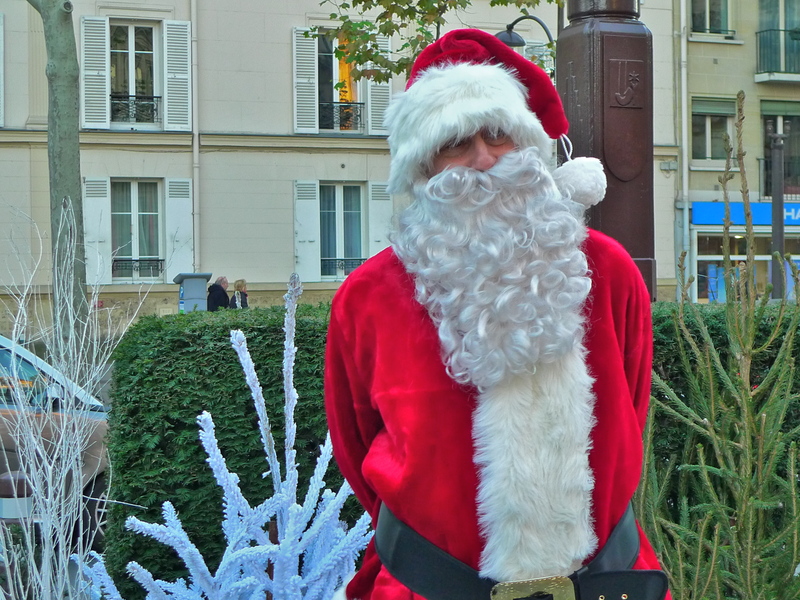 To the west is the very large one at La Défense with its 350 châlets standing in the shadow of la Grande Arche, to the east is the most visited Christmas market in Paris stretching along the Champs Elysées and then, at the bottom of my little street, is the one closest to home. 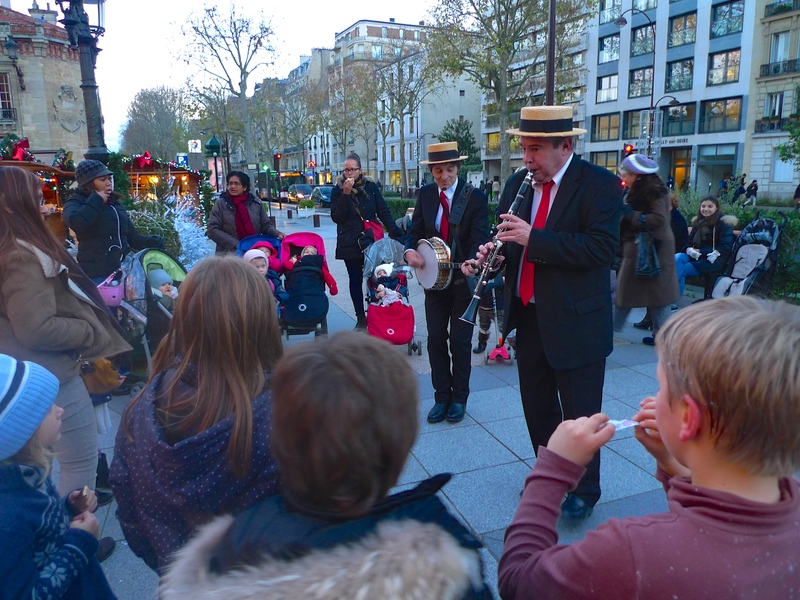 The Christmas markets at La Défense and along the Champs Elysées are very big, mostly swamped with visitors and quite impersonal whereas my local Christmas market is tiny in comparison but what it lacks in size it more than makes up for in congeniality. 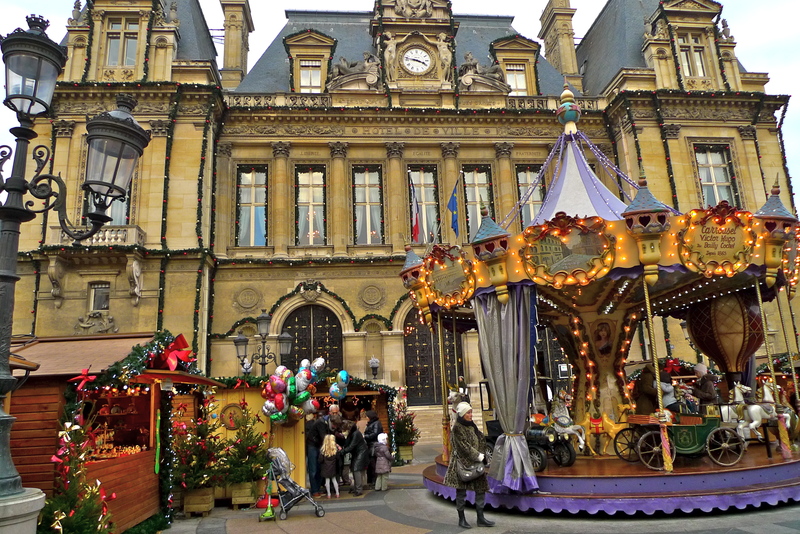 My local Christmas market is now open for business so I’ve been to have a look, to savour the atmosphere and to capture the sights and sounds. 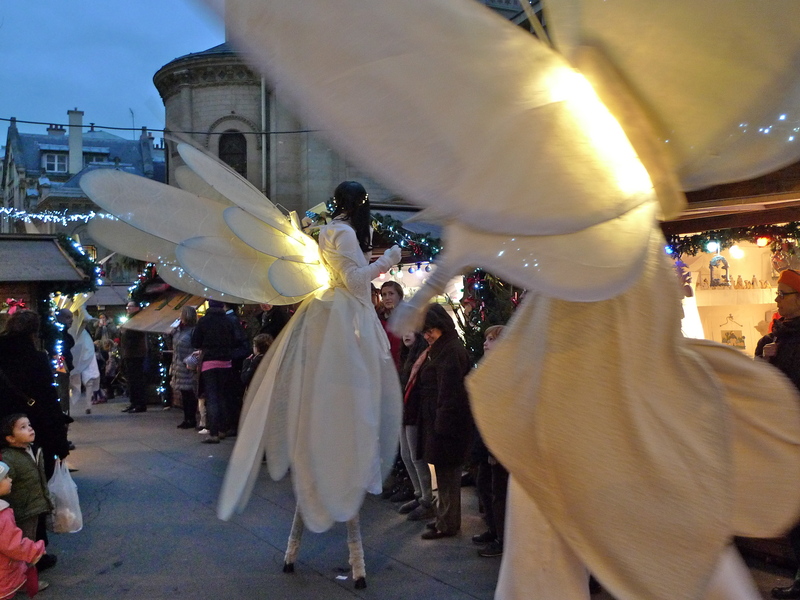 Contrary to what you might think, the sounds in the big Christmas markets can often be quite bland but in my local Christmas market I enjoyed a sonic treat – two different bands, a street organ and singer, electronic music accompanying butterfly elves on stilts, a balloon sculptress with enormous boots and, of course, the sounds of lots of excited small children. 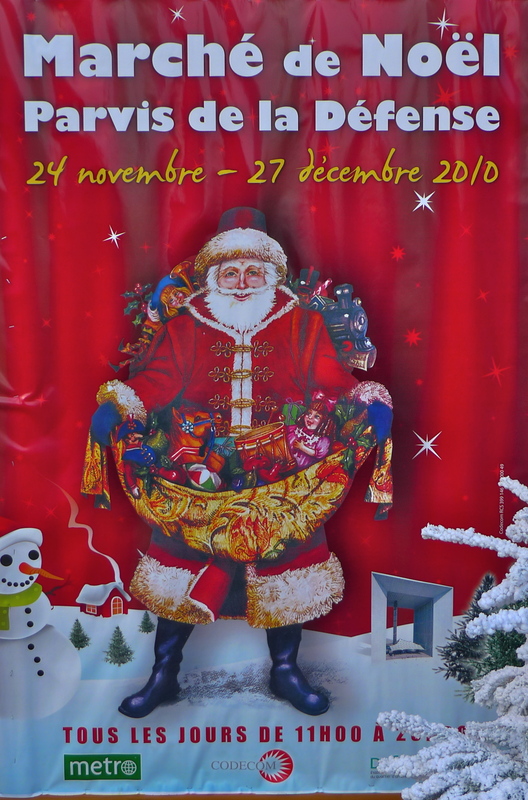 MY LAST POST WAS ABOUT the Christmas market in La Défense. 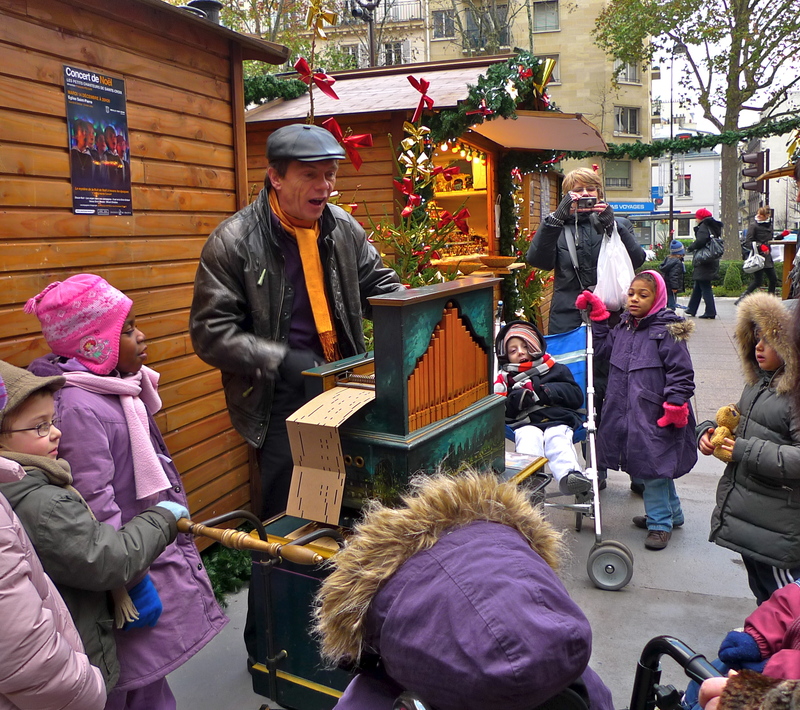 This post is about a Christmas market even closer to home – the Christmas market here in Neuilly sur Seine. 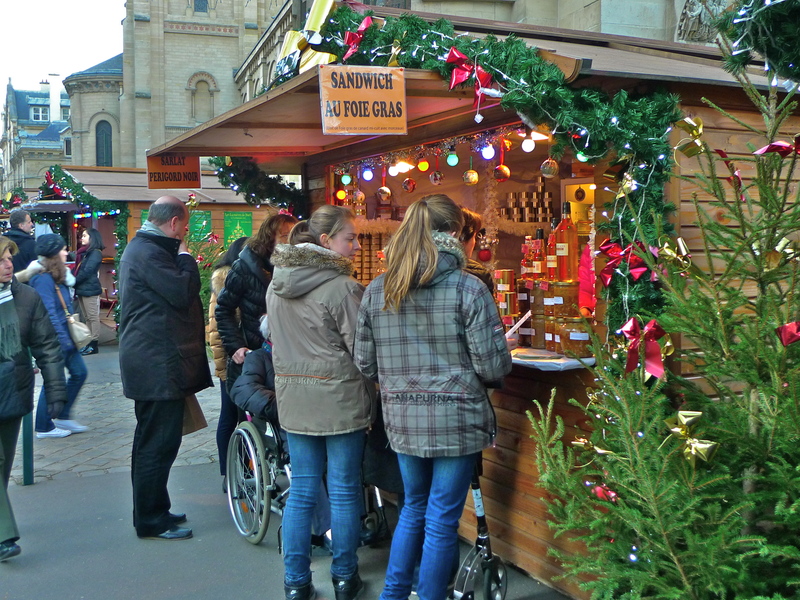 This Christmas market is a short hop from the bottom of my little street. 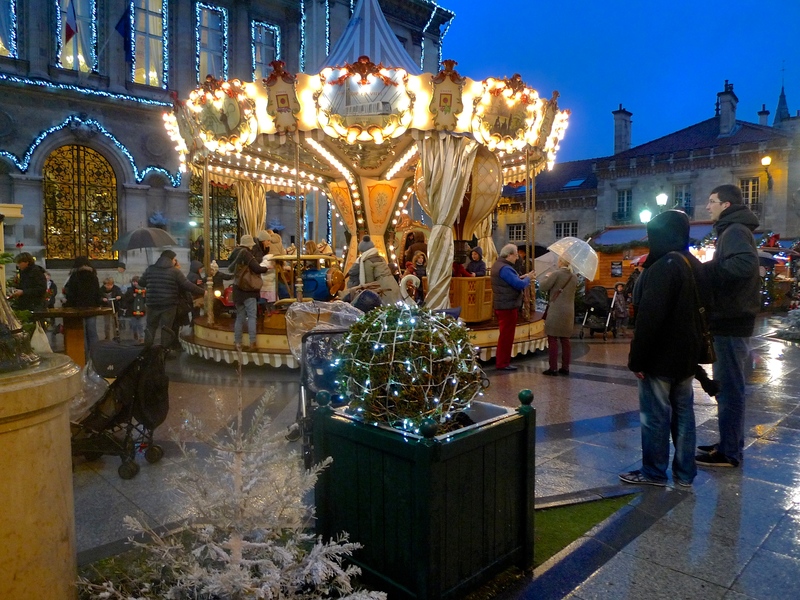 Walking past a couple of cafés, the best boulangerie in Paris, a Chinese traiteur and an electrical shop, one comes to the Parvis of the Hôtel de Ville which hosts our Christmas market. 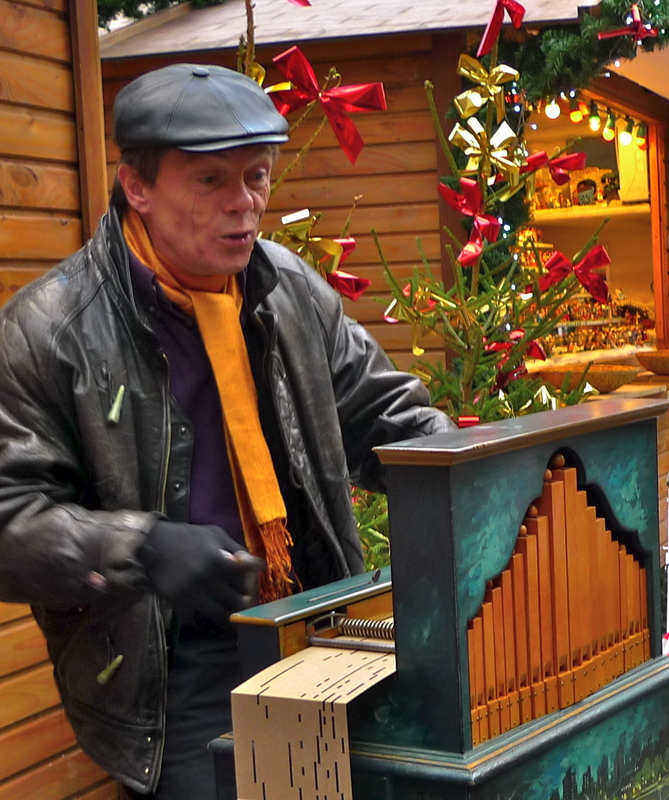 It comprises about thirty wooden châlets nestling close together on the Parvis selling everything one would expect to find at a Christmas market. It’s all very local and very intimate. 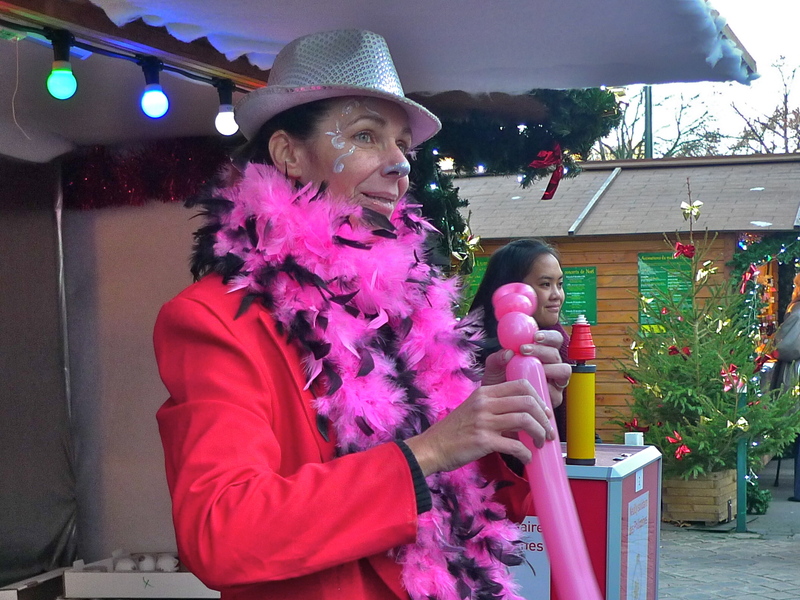 Small it may be but this Christmas market still manages to throw up surprises. 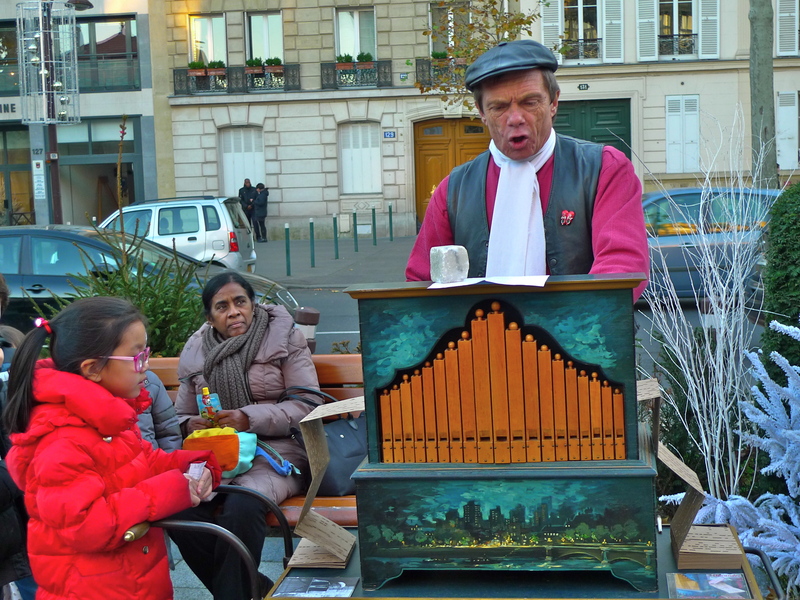 Much to my delight, I found this gentleman playing his little street organ and singing as I was walking through the market the other day. And more was to follow. 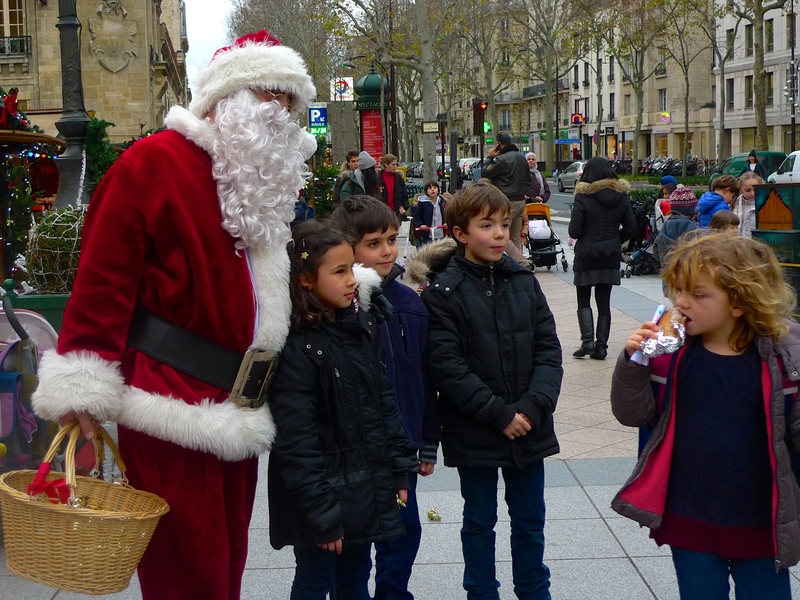 A small group of children from the Ecole Maternelle close by were being shown round the market. 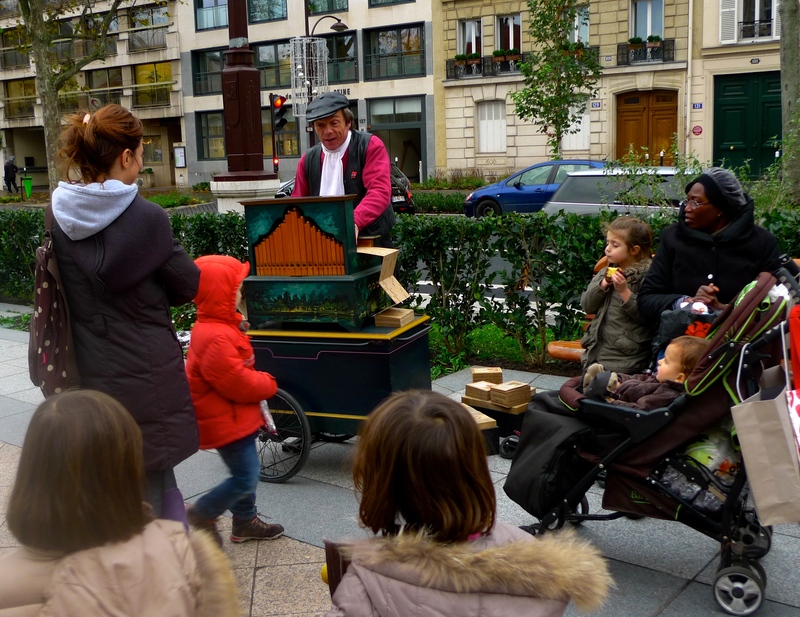 When this gentleman saw them he ushered them around him and began to play a popular French children’s Christmas song – and the children all joined in enthusiastically. 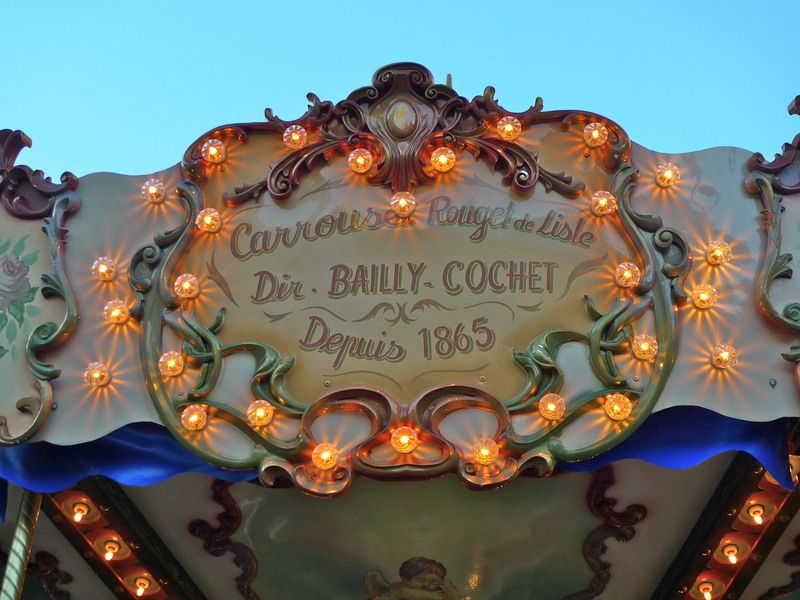 It was a real delight to listen to. 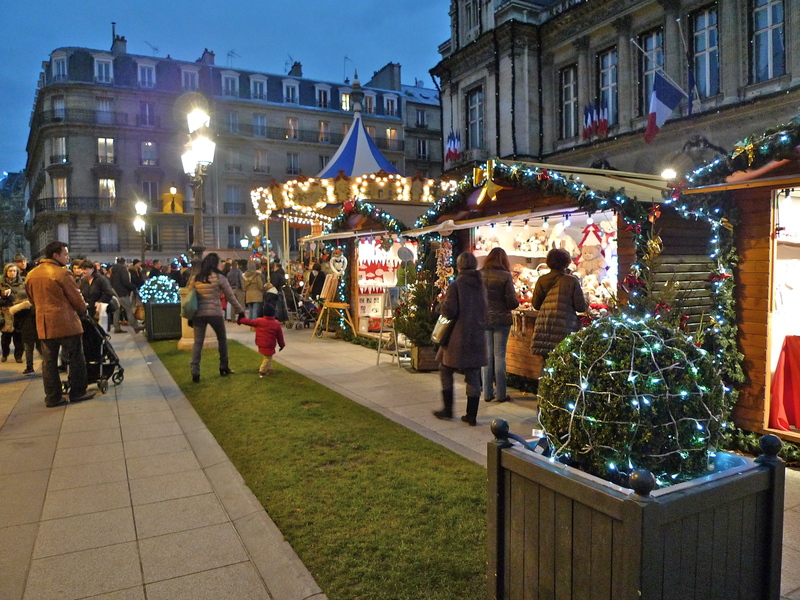 Compared to the giant Christmas market in the Champs Elysées our little market here in Neuilly is tiny – but I know which I prefer. 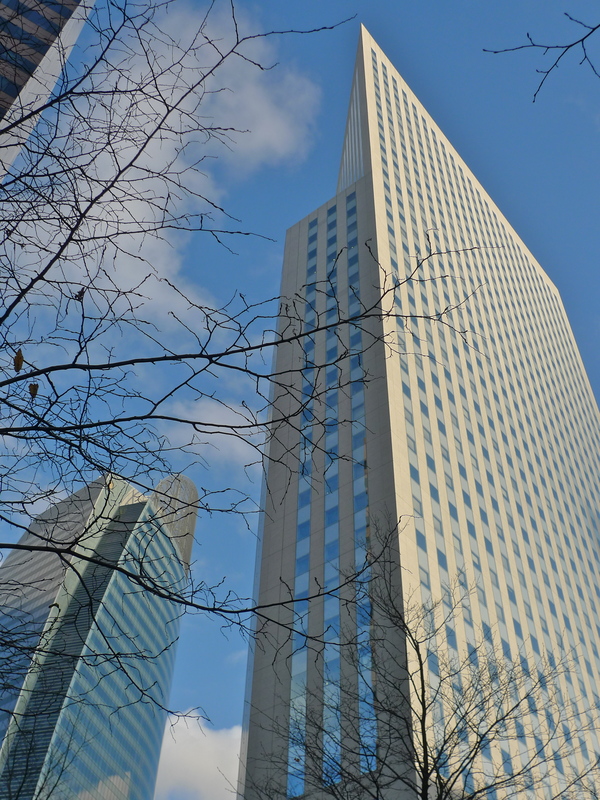 LA DEFENSE, IN THE FAR WEST of Paris, is a high-rise business ghetto and home to many French and multi-national companies. 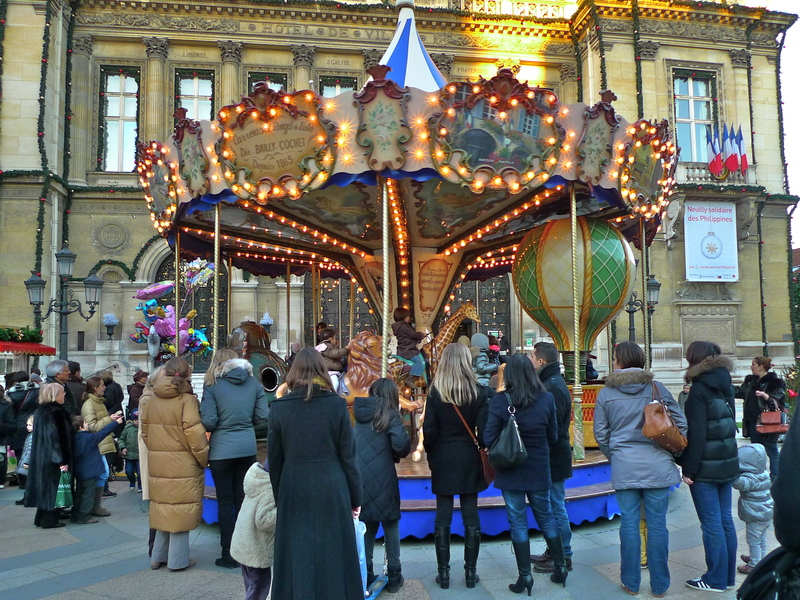 It is quite unlike any other area of Paris. 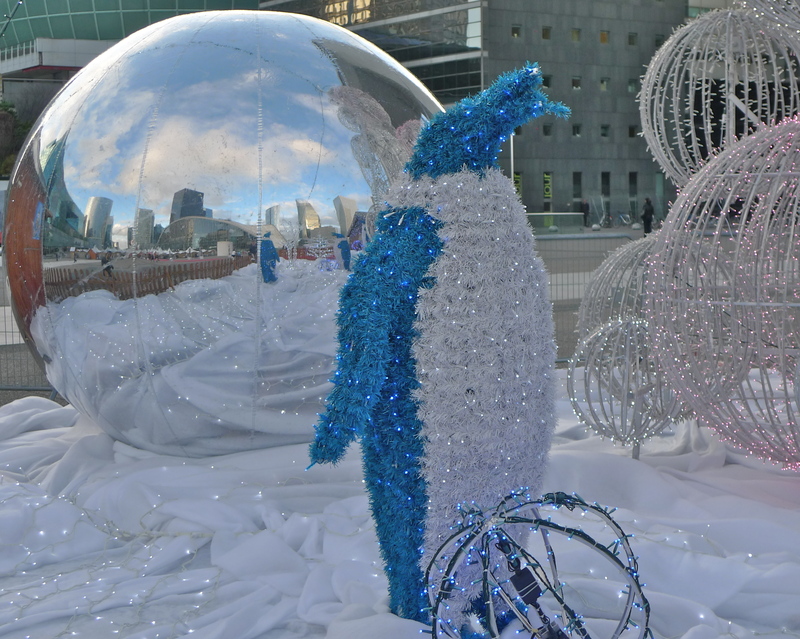 In early November each year on the Parvis of La Défense, in front of La Grande Arche, construction of the annual Christmas market begins. 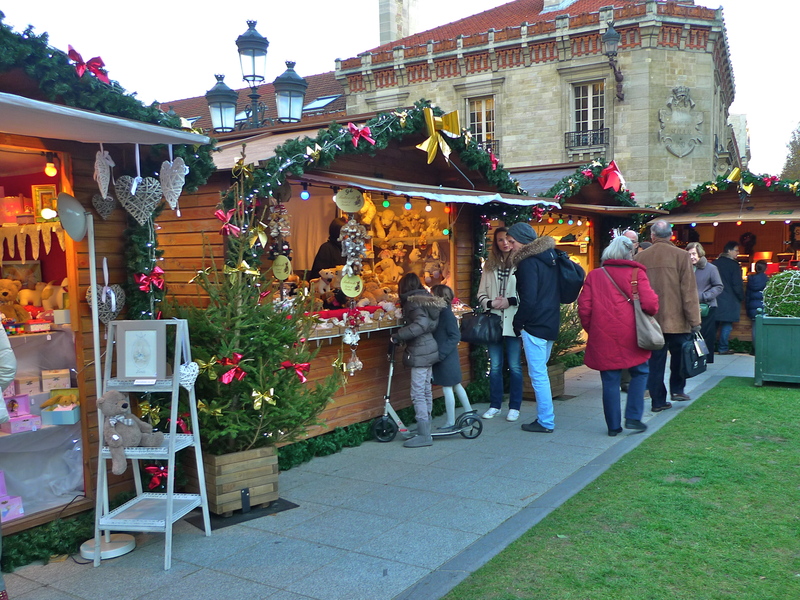 With its wooden châlets selling almost everything you can think of, this Christmas market looks quite surreal against the landscape that is La Défense. 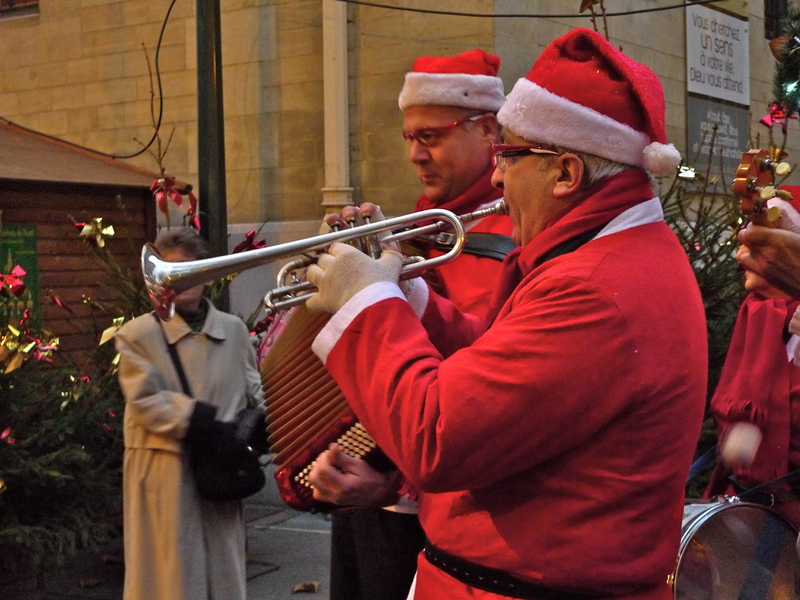 This year the market opened for business on 24th November and it lasts until 27th December. 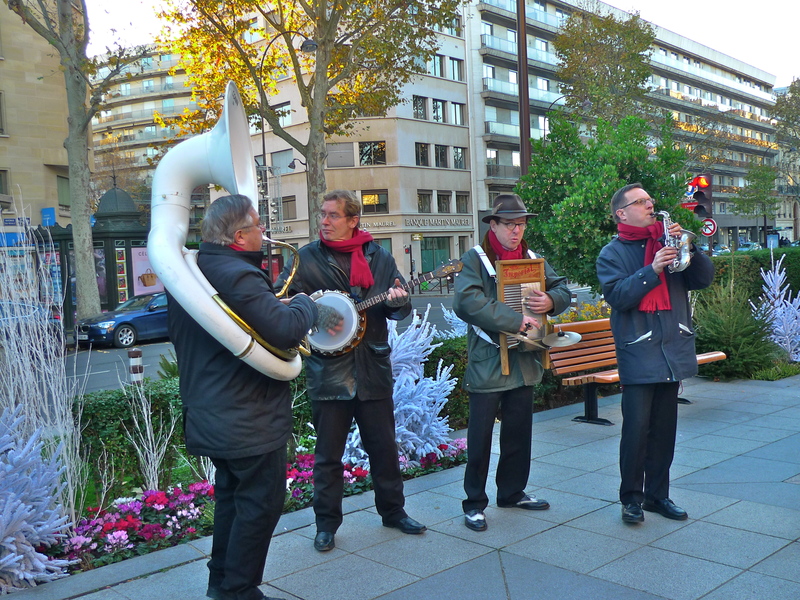 Of course, the Marché de Noël in La Défense is not the only show in town. 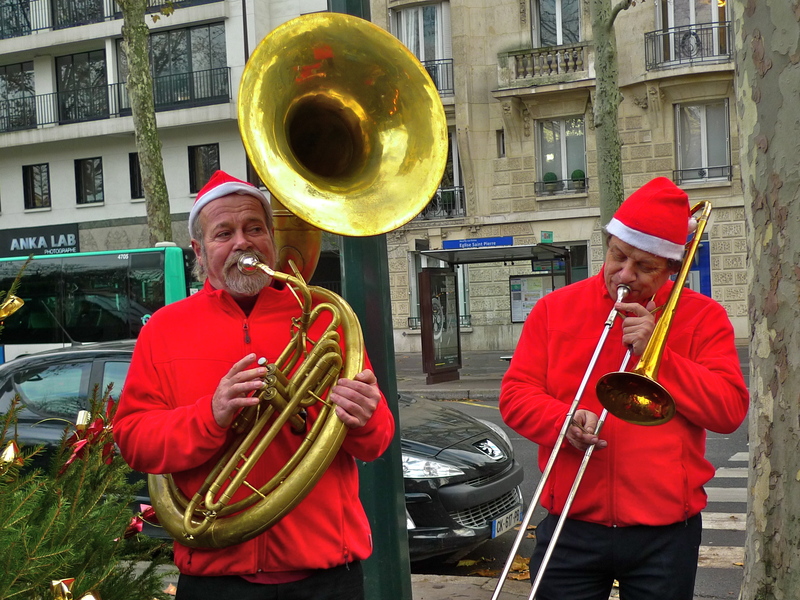 The huge Christmas market in the Champs Elysées, with its rows of white châlets lining both sides of the avenue from the Rond Point all the way down to Place de la Concorde, is expected to host around 15 million visitors this year. 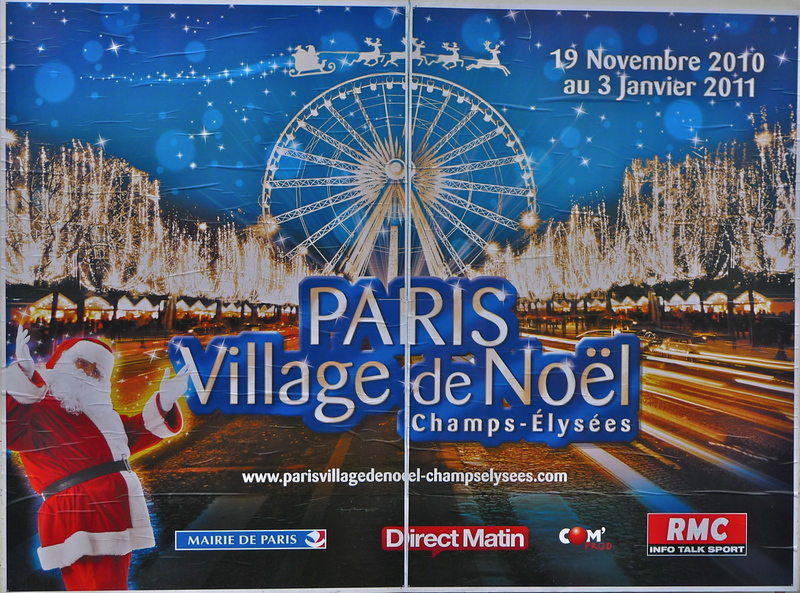 Although the Marché de Noël in La Défense is much smaller, it is also more intimate and, since it is just two Metro stops from my quartier, I prefer it. Of all the wide variety of things on sale, my favourites are the wonderful food stalls of which there are many. 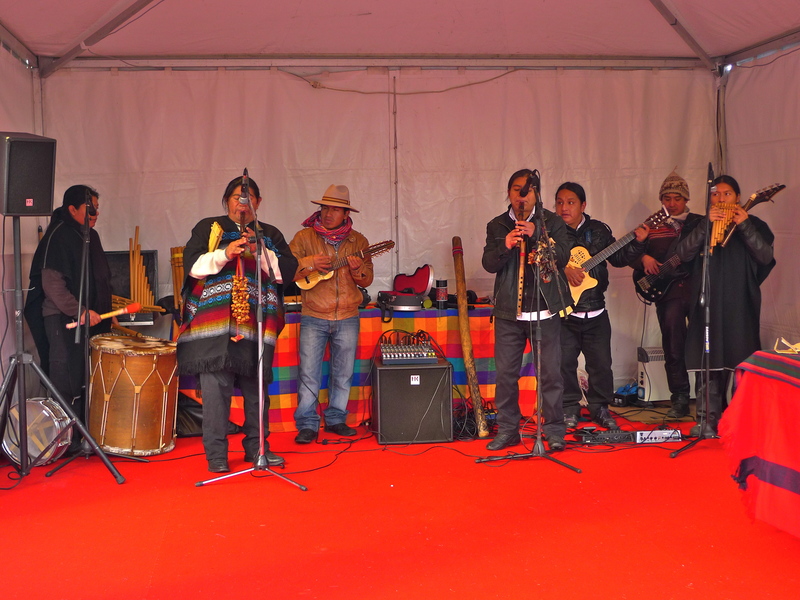 As well as being rich in delicious food, the Marché de Noël in La Défense is also rich in sound and this group of South Americans are well-known street musicians in Paris. 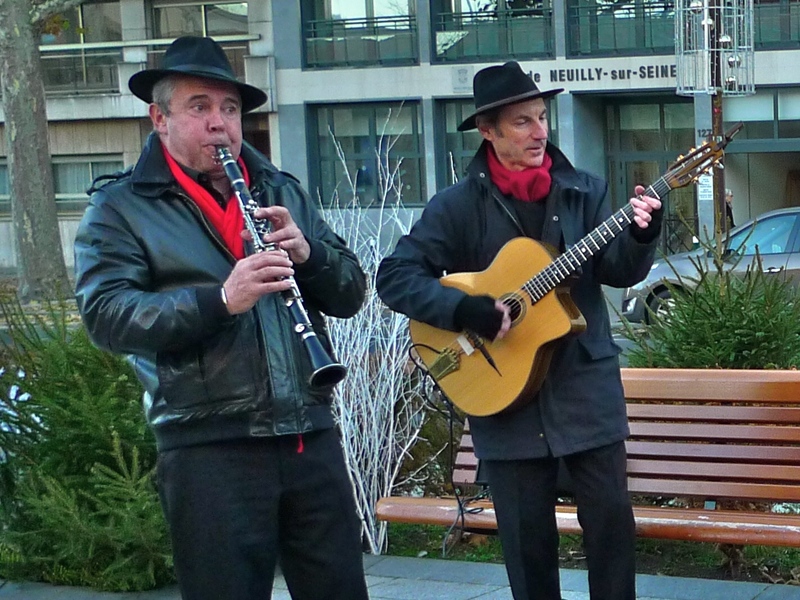 They can be found playing on the streets and in the Metro – and they are also an annual feature of the Marché de Noël in La Défense. 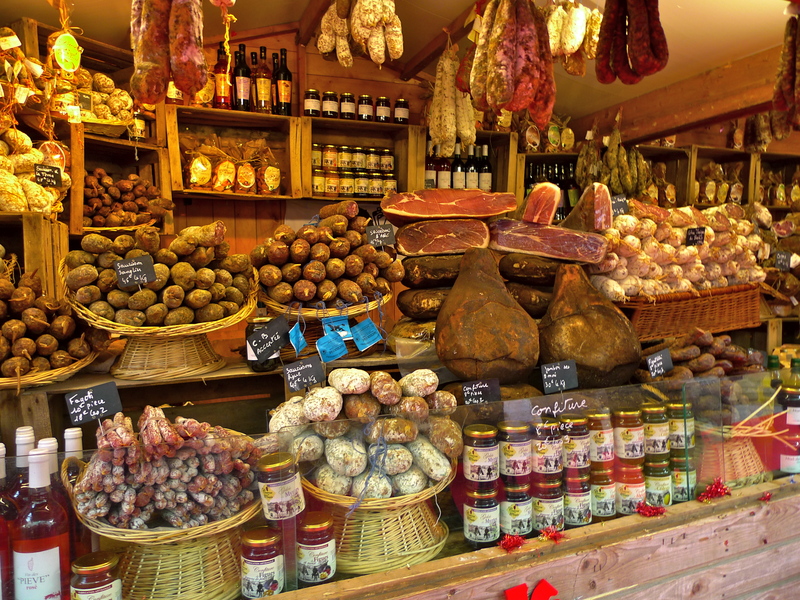 Not the Christmas fare that some of us would expect – but delicious nevertheless.